The Lindens seem to have finally realised that they are indeed "building a country." This is a fascinating summary, and I'll be back to read it more thoroughly, but I'm fairly certain that Philip Linden said this in an early interview with the mainstream press, possibly even the New York Times or his first Washington Post piece. He may have also said it in a town hall meeting, which is why it may not show up in Google but it will within SL. I don't see any reason to dispute that he said it, but he did double back on it later. It was the kind of enthusiastic thing Philip would say in some moments. A key to understanding the FIC and the Ulrika Zugzwang adventure is that she did NOT have followers -- this was a tiny sect. But the Lindens, who were prone to socialist experiments themselves, amplified this in an unseemly and unfair way. They held a contest for anyone to propose a winter themed sim, and they would give them a sim cost-free, with only the monthly tier to pay thereafter. That was a value at the time of some $1000 US. A huge prize, given the newness of SL, and the expense of land, which loomed very high back in those days with few large landowners. The contest was run by Haney Linden, who left the lab some time later to work for Omidyar's Better World network website, so he was very plugged into the whole LL constellation, he then left there when it was dismantled, not sure where he is now. Haney was great friends with Ulrika and a great supporter of this government experiment. Ulrika and the few other Neualtenbergers were the only people who submitted anything to this contest, so they won it by default. Now, you could bang people over the head and say it's their own fault if they don't participate, but again, you had to have resources to take on a burden of $195 US a month even with this prize and it could not be resold obviously (the exact circumstances under which later it was relinquished to the Lindens and Nberg gained an island are murky to me). Snow was devaluing at the time as the Lindens had overmarketed it as a novelty and it went from a real estate bubble to a crash, perhaps that motivated the contest, not sure of the dates there. Instead of delaying the closure of the contest and getting more submissions, they just handed the sim over to Ulrika and the rest is history. She stormed the forums and made a total annoyance of herself for years. She faced utter impunity from her nastiness on the forums as no Linden dared to discipline her after her win of the fancy showcase governance snow sim. Ulrika was ultimately deposed and forced out of the community even by her fellow socialists. The links on Hamlet's blog don't work and lead to a "closed" message, but if you go on the forums as they are now today, and just plug in search terms together like "Ulrika" and "Robin" or "Neualtenberg" you get a lot of it. Thank you, Prokofy, for this information. 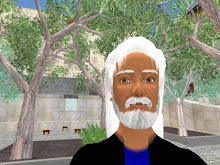 Democracy Island, opened in 2005, attempted to offer an online space to create a virtual town hall where civic groups and government agencies could meet to discuss public issues. The experiment apparently was failure, but details are hard to find using Google. According to Gwyneth Llewelyn, the original "building a country" statement was made by Philip Rosedale in an interview to Wired magazine on 2004-05-08. Philip said: "I'm not building a game. I'm building a new country."